(This post contains affiliate links, which means I will be compensated if you make a purchase after clicking on these links). It's graduation season! I'm sure you all know a few people who are graduating this spring. This champagne/wine bottle cover makes a cute and festive addition to a bottle of wine or champagne, making a nice gift for the college graduate. You could even use it for high school graduates by putting it over a bottle of sparking grape juice. I originally saw this idea on Pinterest, but when I went to the page, it was a dead link (so frustrating when that happens!) I tried searching for the original blog, but the blog had been removed. A further search brought up some results from Etsy, where these were being sold for $20. I knew I could figure out how to make this myself, and sure enough, I did, and was able to make it for about $2. I can spend that extra $18 on my graduate friend! It took a little bit to figure out the pattern, but once I did it really wasn't so bad. Now I'm sharing the pattern with you, so you don't have to figure it out for yourself! One rectangle 12" (the length of the felt) by 6"
One rectangle 12" by 5"
One rectangle 1" by 4"
Fold the 5" x 12" rectangle in half lengthwise (or what we teachers call "hotdog style"). Sew 3" in on each end (where marked in the picture below in white chalk). Leave the center 6" open. The sewn parts will form the sleeves of the gown. On the folded edge, cut a triangle (a diamond when it is unfolded) piece out of the center, roughly an inch and a half wide. Through one layer only, cut from the tip of the diamond you just made through to the edge. This will make the front opening of the gown. Now comes the finicky part, but I promise it's not that bad, it's just a little hard to explain, so bear with me. You're going to connect one of the 12" sides of the 6" x 12" rectangle to the top part of the gown you just created in order to make the bottom part of the gown. The 12" length of the rectangle will wrap around the top part of the gown from the front, under the sleeve, across the back and under the second sleeve, and back to the other front edge. I found it was easiest to sew this in three separate seams. Keep right sides together. Start by lining up the end of the rectangle with the open edge of the top part of the gown; pin it from there to the start of the sleeve seam. Sew just this length. Hopefully this picture will illustrate this a little more clearly. Repeat this process with the other end of the rectangle, matching it up with the other edge of the front opening. You've now put together a mini little graduation gown! Turn the little gown right-side out. Topstitch the front closed from the neck edge down to the seam (or a little above it, it doesn't really matter). Set the gown aside for a bit. Cut a scrap of paper 2" by 3". Roll up the paper across the 3" side, so that you have a little diploma 2" tall. Tie a bow around it with embroidery floss. I put a little drop of glue on top of the bow to keep it from coming untied and to help hold it to the diploma. Slide the gown over the wine/champagne bottle. Run some black thread from one sleeve to the other, as shown in the picture below. Pull the thread tighter to bring the sleeves together at the front of the gown. You can leave a small gap between the sleeves (1/4-1/2"). Run the needle and thread through both sleeves another 3 or 4 times. Don't cut the thread yet. Run the needle through the embroidery thread on the back of the diploma. Pull the thread tight to bring the diploma up to the sleeves. Knot the thread and add some glue to make sure the diploma is extra secure. Take the little rectangle and sew the ends together using about 1/4" seam allowance. Flip it so the seam allowance is on the inside. You should now have a cylinder. Run some glue along one of the circle edges. Glue the cylinder onto the center of the square piece of felt. While the glue is drying, make a tassel from the embroidery floss. I like this method by Martha Stewart, and used cardboard about 1 1/2-2" high. I just love this little tassel! So adorable! Thread the hanging part of the tassel through a yarn needle. Poke the yarn needle through the center of the graduation cap. Make sure the needle goes from the outside of the cap to the inside. Pull the needle and tassel through the cap. Pull the tassel all the way through so the top of the tassel is against the top of the cap. Don't worry, it won't be like this when you're finished. With the tassel being pulled all the way through, it gives you some more room to knot off the tassel from the underside. Put a decent-sized knot in the embroidery floss about an inch from the top of the tassel and cut the thread. 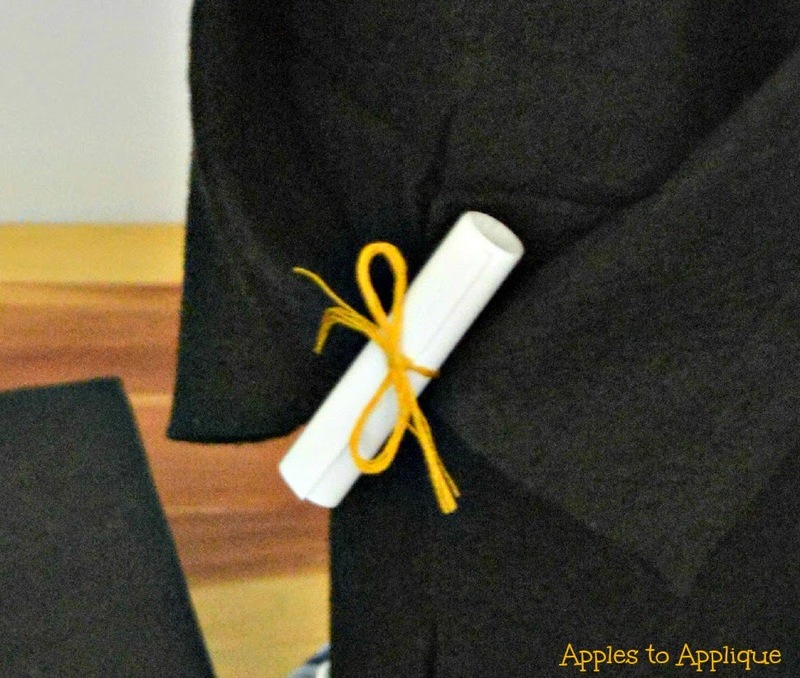 Pull the tassel back out until the knot stops it, and it should hang neatly off the edge. Put the cap on top of the bottle and you're done! You have a fun gift to present to the special graduate in your life. If you want to give a little something extra (like maybe the money you saved making this yourself instead of buying it), I think it would be fun to roll up some money and slide it down inside the diploma. All graduates love cash! What special people do you know who are graduating this spring? What were your favorite gifts when you graduated from high school or college? If you enjoyed this tutorial, please subscribe to my email list and follow me on social media; the buttons are at the top-right corner of my blog. Thank you! Linking up with Sweet Tea Social, Treasure Box Tuesday, Worthwhile Wednesday, the Wednesday Roundup and Inspiration Spotlight. Thanks, Aleshea. I had fun putting it together. Thanks for the kind words, Meredith; I really try to put together well-thought-out posts, and I so appreciate you noticing. Congratulations on your graduation! What a beautiful gift for a friend who is graduation! You put a lot of effort into this post! The picture are perfect for people like me who aren't very crafty! I feel like EVEN i could do it! You did a wonderful job! This is an idea I could try for clients. Thanks, Nicole! I hope you enjoy making these for your clients. I love this idea! I'm planning a delayed graduation party for my son. I'll have use this! Thanks for sharing! I'm so glad you like it; have fun celebrating your son's graduation! Thank you! I know I would have liked something like this when I graduated from college. What a cute idea! My daughter is graduating high school in a few weeks so I've been on the lookout for graduation ideas. Thanks for sharing! Thanks, Joy! I'm happy with how it turned out. Where do I buy the tassel or how to make it? There is a link in the post to the tutorial I used to make the tassel. No, I do not have a video. I'm sorry you found it confusing; I tried to show every little step clearly in the photographs. I just completed mine! Thank you for this! Glad you found the tutorial useful! I'm sure your recipient loved it!